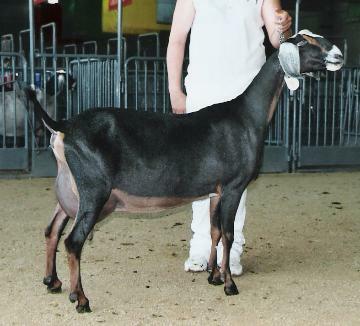 Tessa was the quintessential dairy goat. 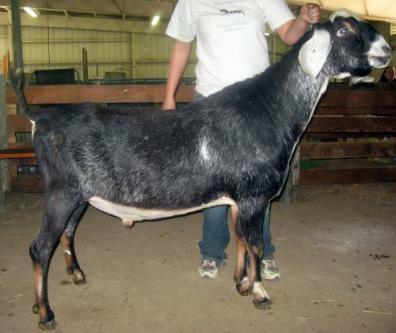 She was also a sweetheart and favorite because of her temperament. 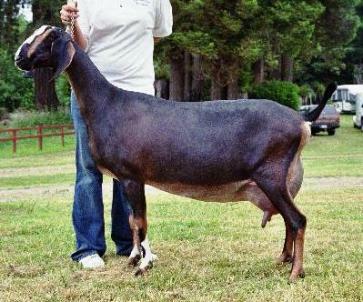 She was the result of breeding SG Brown Sugar's Coup de Grace by AI to a doe tightly bred on our foundation doe, Wingwood-Farm Fire Tamalpais. 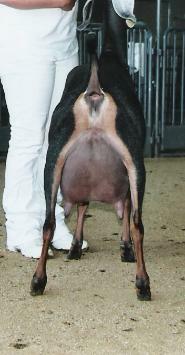 At the 1987 National Show we were very impressed with the tremendous capacity and udder support of Coup de Grace's double grandam, SGCH Silver Thistle's Cabernet. 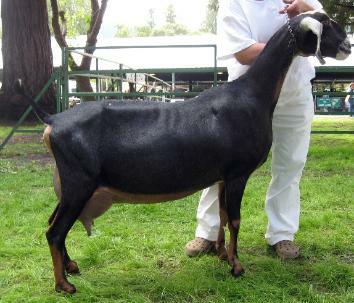 Cabernet is also the dam of SGCH Brown Sugar's Chardonnay, whose son, Brown Sugar's Crown Ambassador, has had a huge impact on the Nubian breed. The breeding gave us improvement in area of udder attachment, especially foreudder, in udder texture, in dairy character and in milking ability. In 2005 as a 3yr old Tessa finished her Permanent Championship and was in the top ten for milk, butterfat and protein production. Her son, SG ++*B Wingwood Farm TS Timothy, has a huge impact on our herd. set of shoulders. 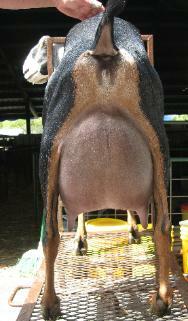 She was a very strong persistent producer with several lactations over 2500 lbs. She also has very high butterfat and protein percentages. 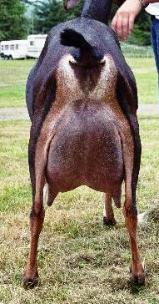 Her udder is impressive for its capacity and shape.